HaYarkon Park – Yarkon Park is just a few minutes drive from downtown Tel Aviv, stretching along the Yarkon River. HaYarkon Park is the green lung of Tel Aviv. There’s a great variety of family activities: you can rent and ride a bike there, take a boat ride, go jogging or rollerblading, visit the botanical gardens and lakes, or just sit on the groomed lawns and enjoy the sun. There are also two outdoor concert venues for music fans. The playgrounds which are spread out at intervals throughout the park. Tsipari is a bird safari and aviary (bird sanctuary) set in lush gardens with a beautiful mini-lake. Children love the petting zoo. You can even hold the birds. If you are brave there is a corner devoted to reptiles. Sportek offers sport facilities for teens and adults – a high climbing wall, trampolines, basketball courts, tennis courts, baseball grounds, soccer fields and a skating area with skateboard ramps. You can rent balls and rollerblades at the Sportek. Meymadion water park offers a wave pool, regular swimming pools, a toddlers’ pool and numerous water slides. Just like in Central Park, you can rent a model yacht operated by remote control and sail it out on the water on Yarkon Lake. Oh, yes, you can rent a bike! The park runs from Tel Aviv port all the way passed the National Stadium in Ramat Gan and on to Bnei Brak. Rokach Boulevard is on the northern side of the park and Bavli on the southern side. You can rent a small motor boat, row boat or pedal boat and travel up and down the Yarkon River. 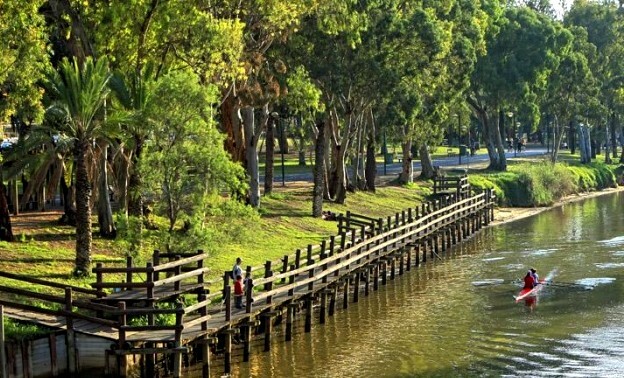 When Yarkon Park opened to the public in 1973, it was originally called Ganei Yehoshua, honoring Yehoshua Rabinovich, the mayor of Tel Aviv between 1969-1974 – but as politics goes it was renamed after the Yarkon River which flows through it. Gan HaSlaim (Rock Garden): The 10 acre Rock Garden is one of the largest of its kind in the world, featuring six acres of cacti and 3,500 species of plants. The mini-golf is tucked away on the northern bank of the river near Ibn Gvirol Bridge on Rokach Blvd. The ancient flour mills are straddled the river at its narrowest point. There were operated by the power of the water flow.